We are breathing a sigh of relief to see Hurricane Ike take its huge self away from us on a western trajectory. Woe is Texas, though. The outer rain bands left us a good amount of rain and some wind, but we're not complaining. We got off easy. This week we were excited to accept some unusual fruit trees for the future Garden. Stephen Brady, a local tropical fruit guru, donated 5 Chinese che (Cudrania tricuspidata). The leaves of this little fruit tree were used in China to feed silkworms when mulberry wasn't available. The fruit is said to be shaped a bit like a mulberry crossed with a lychee (see attached photo). According to Steve, the fruit tastes like a combination of watermelon and fig. We look forward to trying them for ourselves. Speaking of odd fruits, have you sampled the Garden's peanut butter fruit? In the Fruit and Spice area, we have a peanut butter tree (Bunchosia argentea). At this very moment it has clusters of bright orange fruit. When the fruit is fully ripe and soft, the texture and flavor are slightly reminiscent of peanut butter. You can imagine what a hit it is with young visitors. Another donation came from Ronald Rumbaugh, the former Parks Director of Miami Beach. If you will recall, he donated four baobab trees (Adansonia sp). This time around he donated a highly prized licuala palm (Licuala sp). This slow-growing palm has circular fronds that are evocative of the tropics. A trip to ECHO (Educational Concerns for Hunger Organization) in north Ft. Myers introduced the horticulture staff to the challenges of extreme gardening. ECHO's mission is to help families grow food crops in areas with difficult conditions. Their demonstration garden is divided into 6 areas: tropical highlands, urban rooftops, tropical monsoon, tropical rainforest, semi-arid tropics, and hot humid lowlands. They send their interns into the world to educate families about crops that they can grow with a single packet of seed. Their agriculture consultant Larry Yarger rolled out the red carpet for our visit, and we hope they'll visit the Garden soon so we can show them what we're up to. If you haven't been to ECHO or haven't been in the last couple years, you're in for a surprise. When you go, don’t miss the store, which has great books and seeds, and the well-stocked tropical fruit nursery. Check them out at www.echonet.org. Next time you're at the Garden, if you hear a steady buzzing overhead, it might be aerial mosquito spraying, but it’s more likely a hive of honeybees. These busy little guys and girls (actually workers and drones) have established themselves high up in the fronds of the foxtail palms (Wodyetia bifurcata) right off the visitor parking lot. They're not bothering anyone so we're not going to bother them. In fact, they're helping us by pollinating the flowers at the Garden. Just think of them as volunteers! A plant blooming for the first time in recent memory caught our attention: Augusta rivalis. This particular evergreen shrub isn't much to look at but its flowers are white trumpets that are super fragrant. It's nestled in the same bed as the ylang ylang (Cananga fruticosa) directly outside the herbarium. We have two others in the nursery that are also flowering. By the way, the ylang ylang is outdoing itself this year. Its branches are draped with those floppy yellow petals whose lovely fragrance is simply intoxicating. 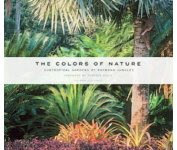 Raymond Jungles, the landscape architect for our future Brazilian Garden, has a new book coming out in October: The Colors of Nature: Subtropical Gardens by Raymond Jungles. The front cover has an image from Fairchild Tropical Botanic Garden (see attached photo). The back cover shows the Key West garden of Judy Blume, a well-known children's book author. Movement is afoot to launch our life-long learning lecture and workshop series. David Webb, the new education manager, is organizing a lineup of topics and speakers that are sure to get you back to the Garden. This program is tentatively scheduled to start in November and run to April, with two events per month. If you've got an idea for a topic or know of any expert, drop David an email at dwebb@naplesgarden.org. Next week all you Garden fans are going to have to go without. I'm off to Portland, OR, for the Garden Writers Symposium. The favorite topic is always--you guessed it--plants, but they'll also be talking about blogs, newsletters, "green" products, and trends in gardening. Then we traipse around to private gardens, botanical gardens, garden centers, nurseries--same as what I do here in Florida--only these are in Portland. The next Tropical Mosaic Garden visit is this coming week, Wednesday, September 17th. If you're in the neighborhood, check us out between 9am and noon.